I have read this book with the Book Bloggers Unite! Book club, run by me, Emma and Sophie. Want to join? Find out more here! The plot…at first, was really, really confusing. I didn’t understand the characters or the plot. But after around the first half, it really picked up. It was extremely thrilling and full of intriguing plot twists! The characters…as I said above, were at first, extremely confusing. The book is written in alternate chapters, written from the viewpoint of 6 different people. But Leigh has got skills, and she pulls this off (eventually). The writing…is very good. Not outstanding, and a little confusing, but still amazing. I love the world Leigh managed to create, a world of intruiging heists and interesting people. Beautiful, in a way. Something I liked…is actually the alternating character viewpoints. It was really nice to see inside the minds of not only one or two people, but six. And not only that, but to be able to pull it off! I really look up to Leigh for that. Something I didn’t like…was the entire first half of the book. Unfortunately, I just didn’t see the…point. I suppose it was needed for character building, but the first half is told without the characters actually being together, which just doesn’t really make sense. Luckily, the second half – surprisingly but very impressively – completely made up for this. The book as an object…wow. This is not something I’d normally talk about, sometimes I’ll mention a cover, but this entire book is…so beautiful. I just can’t not mention it! For a start, the cover is amazing. But not just that, the slipcover feels really weird. Weird in a good way, it’s sort of…soft but rough – and unlike any other book I own. 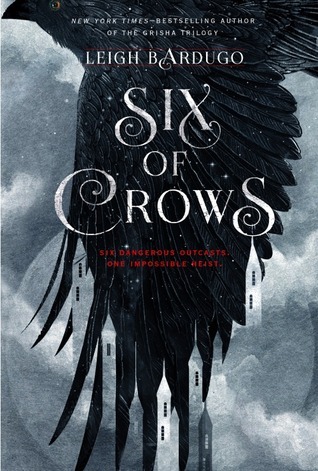 Under the slipcover, the hardcover is really soft, and has a little crow on it. Also, the spine is beautiful – the dark red lettering against the smooth black is just so lovely. But not just these things…the book is just…really something. It is bigger than normal paperbacks, but there is something really special about that. You are forced to hold it in your lap, and really feel the weight and size of the book as a whole. It makes it an experience. As well as all of this, the book has black tinted pages on the edges, which softens into the white on the edge of every single page. But the thing that really got me? Something so unique, it actually surpised me. The font. It’s the same as the cover, but smaller. And I didn’t expect to like it, but I loved it.